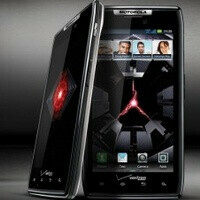 The Motorola DROID RAZR has arrived and it's stunning - it's the thinnest smartphone out there with a 0.28-inch (7.1mm) body. Moreover, it fits LTE in that ultra slim case, but also a 1.2GHz dual-core processor and all the perks of a high-end handset. While most of that fits in a spec sheet, there's something more about the all new RAZR - it comes with kevlar reinforced back side, so it's not only thin, but very durable. Designwise, it features the signature diamond shape present in the latest Moto devices and first seen in the Motorola PHOTON 4G. On the software side it comes with Android 2.3.5 Gingerbread, which might be a bit of a downer, if Android Ice Cream Sandwich gets announced today as expectations are. In either case, it's amazingly thin and this alone should already catch your eye. How does it fare against the current Android elite? Take a look at our spec smackdown including the Samsung Galaxy S II and the Motorola DROID BIONIC, but also the biggest contender from the other camp - the Apple iPhone 4S. And let the Apple bashing commence. 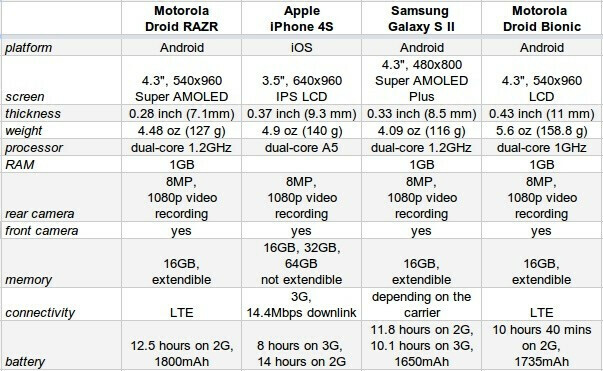 This despite the fact that iPhone 4S is right in line spec wise with all the other phones. You would only say that because you feel the iPhone 4S with its dual-core running 800MHz is in fact inferior. If you truly felt the iPhone 4S was the best you would not have felt the need to even say that! No the reason I said that is everything Apple is inevitably filled with trolls bashing it. This time surprisingly I don't see any yet. Taco, your apple is running 800mhz of A5's like evo just said. And 512 mb of ram is a downer. You can't say otherwise. There would be a few idiots who would start bashing it....but now you started the fight and expected everyone to keep quiet?? That's a bit unfair.And besides, the reason the iphone is disappointing is the fact that the next model will only come out next year. IF an android isn't up to scratch, wait a few months and you'll get a model that will do the needful. But with the iphone, there's no hope for options. You get the same dish whether you love it or hate it. Android guy here. I don't really think your ram argument is 100% valid. iOS and android are completely different operation systems. They handle running applications and background tasks completely differently. You only need as much RAM as the system will use. I have an feeling that with the way iOS handles background tasks, 512mb is probably sufficient. Not to date myself, I agree, but this all reminds me so very much of the pc wars of the 90's and RAM is king, the more the better and it won't hurt anything so why not add more RAM, I am sure everyone on here will gladly pay another $30 or $40 for 2Gb of RAM whether it really makes a difference or not. I was only stating facts. But if your argument is correct, then i would like to put forth that it only needs 512 mb because it can't do true multitasking. It also has the most amazing bluetooth, but file-transfers being disabled is a backward step. Then the fact that its made of some fragile glass also makes it lose in the durability section. It's no longer the thinnest with the likes of the galaxy S2 and the motorola droid razr. It's also not the the only smooth thing. The reason people say that android lags so much is the fact that they have seen it run on less capable phones. The SGS2 is as smooth as the iphone. It's browsing is also better than it with flash support. It's camera is still better. And in the end, the iphone gives no extendible memory and with 64GB memory cards out, this will be an even bigger issue. and not to mention the small screen size. People who say that 4 inches are too big either have really small hands or are trolling. I had difficulty typing on a sensation and that is a huge phone. I could go on and on...but I've already proved that the iphone has major issues just jumping on from one version to the next. And in the end, it is a failure to techies who actually understand the science of a phone and a company and don't depend on commercials and hype to buy a smartphone. I rest my case. Another Android guy here.. seriously.. get off your Android horse! Bottom line is that the iPhone is a good phone. The fact that the dual core A5 can be as good as it is at 800mhz is pretty awesome I think. At the end of the day, who cares about how many MHZ the processor is if it preforms smoothly and without problem. It pretty much boils down to the fact that Apple has their ecosystem so tightly integrated that they can optimize for this kind of processor. Comparing numbers between the phones is kind of pointless in regards to processor speed and RAM. Personally, I think that's great.. go Apple! I'm still an Android fan. Period. I enjoy the OS and what it has to offer over iOS. I'm very much looking forward to the Razr and PRIME, which I would happily take over an iPhone any day. But, just because I enjoy Android, doesn't take away from the fact that Apple makes one hell of a phone! It's just not for me. So are you doing a preemptive remark to the non existing trolling. To me that sounds more like instigation than anything else. It's just that you came off as a bad guy in this. There really was no reason for the comment. It’s just that you are looking for some type of confrontation or something! taco, i completely agree with evo here. i hate the android trolling, but the apple trolling (though less), is just as bad. you instigating isnt helping anything. i really, really like the razr. if only it came with ICS, i would really like to have it. i get the feeling it will sell pretty well despite the prime being announced and launched at the same time. Yeah give me a break taco, the only reason you said what you said is because you know your precious iPhone is just not up to par like Androids are and also because your buddy's at PhoneArena were nice enough to leave off the specs of the ram and processor of the iPhone and they also left out the specs of the front facing cameras, which your precious iPhone still only has a VGA, while the others at least have 1.3MP and the Galaxy S2 has a 2.0MP. Oh and then there is that 3.5" display, which is nearly an inch smaller then all the other devices, which you might say an inch doesn't really make that big of a difference, but I bet your girl would beg to differ. If you have one that is. Anyways I hardly think that is right inline spec wise. You iTard! Well if you call the wolf the wolf will come, but hey o guess you like that don't you? My only gripe with the iPhone 4S is the screen size. Honestly if it was a 4.3 screen I would consider trying it out. I think the Iphone is a great phone, but just not for me. Its easy to use, has great applications, very fast, amazing camera, and a very good looking screen. I just wont own one because: it has a small screen, it needs itunes and what not to be able to add music, video, etc. It has no hdmi output. no extendible memory, and finally its made of glass. Again these are all IMO. to each their own. now somthing is really wrong with this sites comment section. even though Im an android fan, and hate apple ( I like iphones, ipod, and prity much everything they make, just hate their marketing and closed system) , I really agree with this guys comment. and I really dont get why should anyone thumbsdown it. is it just because he is an iOS fan?? I would tend to agree with the other replies: Even though the screen size is an issue, it is otherwise comparable to the other phones it is stacked against. However, the big kicker for me is the lack of LTE/4G. When every other flagship phone is getting the LTE treatment from Verizon, it makes the 4s an unappealing choice. Guy just love trying to incite fights... but I guess it keeps things interesting. You know, I wouldn't have said anything derogatory about the iPhone had you not gone and done this whole stupid victim complex thing... and I still won't. I will say that considering the battery issues some people are already having with the 4S, it's probably a good thing that Apple held off on LTE, although Motorola has basically just spanked them by releasing a device that relegates the 4S to "third thinnest smartphone ever" that still runs on LTE and has damn good battery life, comparable to or better than the much thicker Bionic. @taco50. Great move! Invite bashing and then cry later on about people bashing...brilliant! There are a few iphone fans you could take a que from who love there iphones just as much as you, but they dont waste time baiting the Android fans...Wasup Vette! With that out of the way, the Droid Razr is looking REALLY good right about now. I was hopin the Galaxy Nexus would have a better showing, but it just left me confused as to why no Galaxy S 2 for VZW. I know ICS is the next evolution of Android, but with no LTE, no Exynos chip, and 5MP camera, I kinda feel like they announced the iPhone 4S all over again. Not to say it wouldn't be a winner, but higher specs would be a great selling point. You do realize that the iphone have the smallest screen and is the thickest phone out of the four. DROID RAZR have to be the thinnest phone to date. The quality of shots I've gotten on Motorola's phones have been pretty damn good, actually. I've had no complaints.